For a quasi-novelty number, "Judy In Disguise" was still a great party song right through the late 80's. In those days, when was I renting the second floor of a three family home with two other friends in Briarwood, Queens, this song was mandatory on the party tapes. Like The Isley Brothers' "Shout" or The Rascals' "Good Lovin'," it was a blatant 60's -era song that wouldn't quit. 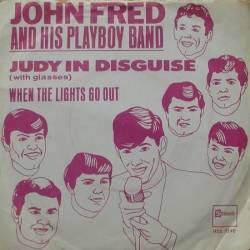 "Judy in Disguise" had its own variation of the tried-and-true bass motif based on the major 6th pattern, also employed artfully from Gary Lewis & The Playboys' "She's Just My Style" to Squeeze's "Black Coffee In Bed." However, "Judy in Disguise" sped faster than any of those variations, with straight ahead drums and the snap of the snare. Much of the song's melody incorporated that major 6th pattern, going up in the first words ("Judy in disguise") and down the next few ("Hey that's what you are"). At first, it sounded like he was singing" Judy in the skies," a parody of The Beatles' "Lucy In The Sky (With Diamonds)" -- which it was. You could clap your hands, shake and shimmy as the horns powered out that major 6th riff, as an unusual set of high strings went front and center for the instrumental break. Those strings also suddenly went out of tune and psychedelic for a few seconds just before the last verse, a subtle dig at the orchestra crescendo of The Beatles' "A Day In The Life." Even the song's end had a detuned guitar following the solo lead vocal. This was probably one of the most cleverly arranged one hit wonders of the 60's. 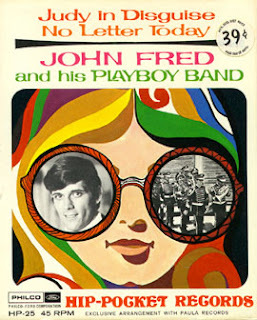 Special attention, though, must be made to the vocals of John Fred, a stage name if there ever was one. He sounds like he's going to break out of control, with subtle vibe of horniness. His vocals are charged with confidence, but it seems like any second, he's going to go nuts. By the time the song hits that weird psychedelic break, with the dissonant strings going up and down, he's panting and moaning, so is he putting you on or not? The video below is really hilarious and of the time, as it was shot on a local Cleveland pop TV show "Upbeat" that was clearly trying to be cool with some green lens effects. At least the band has horn players to play to the track, but where the hell is the drummer? And you've got to love the quick cutaway closeups of the individual musicians, who seem to have no idea what to do. Actually, his name was John Fred Gourrier. He died in 2005.